Where previously 2D objects could only be moved, rotated and animated on a 2D plane, now they too can be manipulated in 3D space. 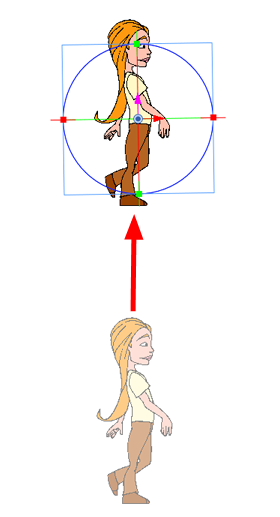 This means that flat, 2D objects can move forward or backward along the Z-axis, growing realistically bigger or smaller as they move towards or away from the camera. Features, such as Always Face Camera, mask the paper thin edges of 2D objects for camera rotations around these objects. 2D objects can be artwork drawn on a given layer, imported images, or flat templates imported from the Library view. 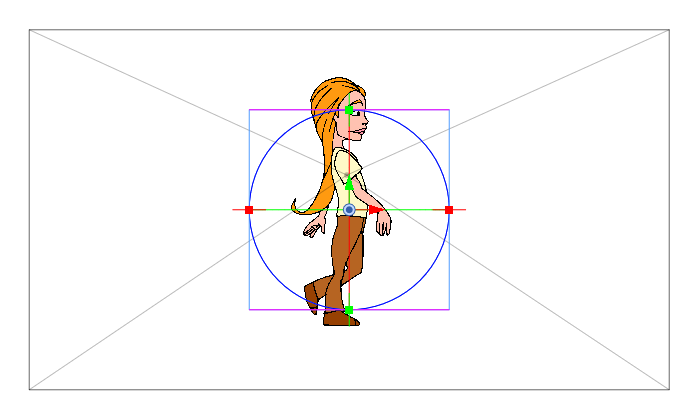 NOTE: Animating a layer and animating a 2D object are interchangeable concepts. They are referred as layers as 2D objects because you are working in 3D space. 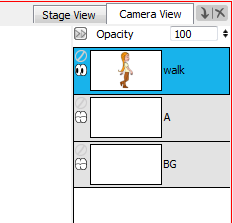 If you draw multiple elements on a single layer, such as the background, these elements will be animated together. Any element that you want to animate separately should be on its own layer. You can manipulate a single 2D object in 3D space, however you can also stagger multiple 2D objects along the Z-axis to make a multiplane or rotate planes to build open-faced rooms. In order for a 2D object to be manipulated in 3D space, the panel must be 3D enabled—see When deleting a 3D model from the 3D Models folder of the Library, every instances of the model used in the project will be deleted at once. A warning message will prompt you to confirm or cancel the action..
Go to the Stage or Camera view. 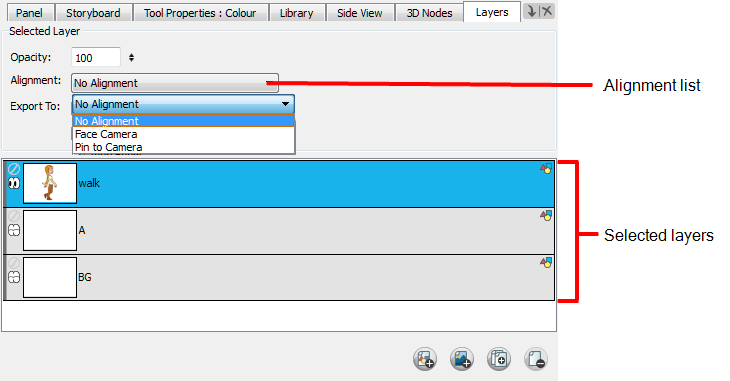 Be sure that your 2D object’s layer is selected. Select the First Frame tool. Manipulators appear over your object layer’s pivot point. 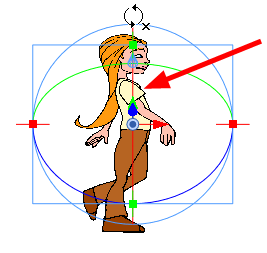 ‣ To squash and stretch your image vertically: Pull the green, square points located at the top and bottom of the manipulator circle. 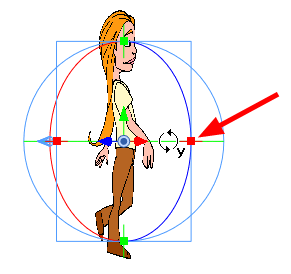 ‣ To squash and stretch the image horizontally: Pull the red, square points located on the right and left sides of the manipulator circle. 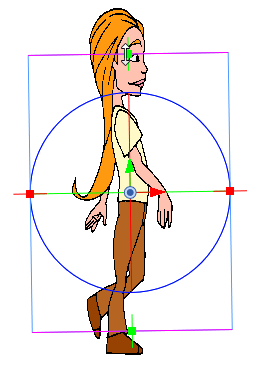 ‣ To scale the image proportionally: Hover anywhere over the box outside the manipulator circle until the cursor turns into a white, double-headed arrow. Pull in any direction to scale the image up or down. ‣ To move the image vertically: Click the green, vertical arrow and pull it up or down. ‣ To move the image horizontally: Click the red, horizontal arrow and pull it left or right. ‣ To move the image backwards or forwards along the Z-axis: Go to either the Top or Side views and use the blue arrow to pull the layer closer or farther from the static camera cone. 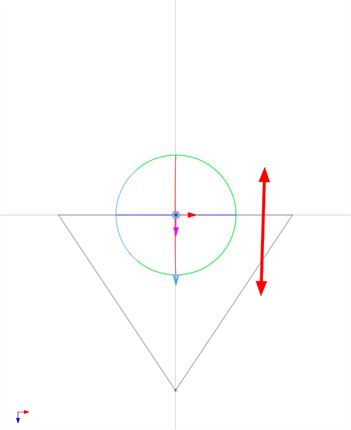 ‣ To rotate the image on the X-axis: Hover over the vertical line (actually a ring) bisecting the manipulator circle. The rotate X-axis cursor appears. Pull up or down to rotate your object along this axis. 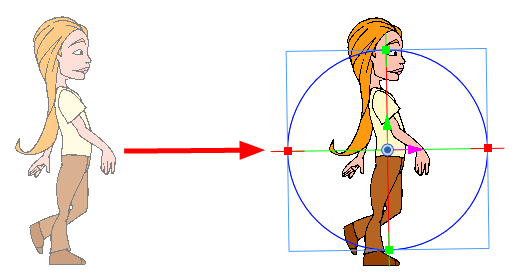 ‣ To rotate the image on the Y-axis: Hover over the horizontal line (actually a ring) bisecting the manipulator circle. The rotate Y-axis cursor appears. Pull towards the left or right to rotate your object along this axis. ‣ To rotate the image on the Z-axis: hover anywhere over the manipulator ring. 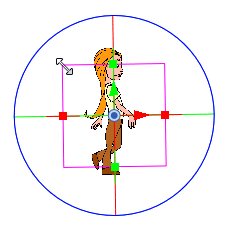 The rotate Z-axis cursor appears. Pull clockwise or counter clockwise to rotate the object. You can perform any of these manipulations in combination. For example, after have rotated your 2D object 45 degrees around the Y-axis, you can reposition it along the Z-axis. The one obvious problem with creating an animated 3D camera rotation around a 2D object, is that you will be able to see the paper thin edges of the 2D object. Fortunately, you can lock the object so it always faces the camera. In the Layers panel, select the layer that contains the 2D object you want to align with the camera. ‣ Face Camera: The layer is oriented to face the camera, so that it rotates around its pivot point to always face the camera, but does not move with the camera. 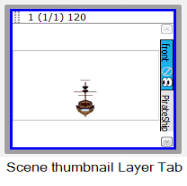 Use this option when you plan to position your 2D layer in 3D space, where that layer belongs in the scene. ‣ Pin to Camera: The layer is oriented to the camera's perspective. Essentially the layer always moves with the camera. The advantage of using this option is that you can simply draw on top of everything in your scene. 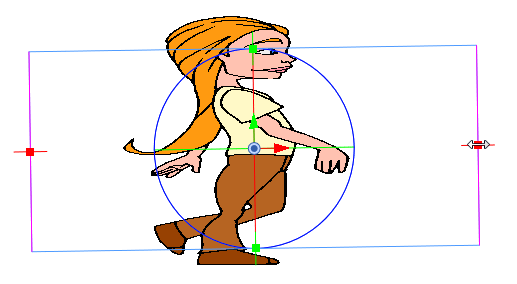 In the Camera view, verify that your once distorted looking 2D object now appears to face the rotated camera. Flat, 2D objects that you have integrated into your 3D scene may need to be edited, even after the camera has been repositioned or rotated in 3D space. 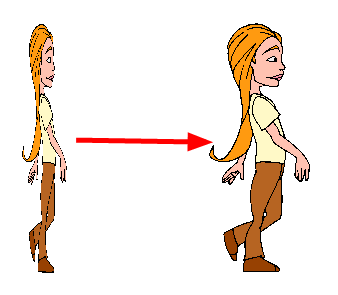 An edit usually entails needing to redraw and recolour part of your object. 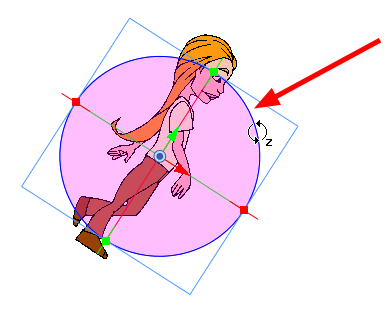 However, after making several rotations or a movement in 3D space, you can reach a situation where the Stage view and the Drawing Layer of your 2D object are no longer parallel to one another. In this case, you will not be able to draw on that layer. In order to make your edits, you will need to use the Look At Selected feature. 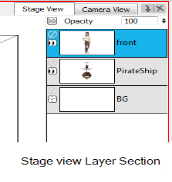 Select the desired layer, by either clicking on that layer in the Stage view’s Layer Section, from the Scene thumbnail’s Layer Tab or directly in the Stage view using either the First Frame or Last Frame tools, depending on which frame you are on. Click the Look At Selected button in the Stage view status bar. The Drawing object layer is perpendicular to the Stage view, ready for drawing edits. NOTE: You can use rotate the light table by pressing: [Ctrl]+[Alt] (Windows) or [⌘]+[Alt] (Mac OS X). You can rotate the Stage view by pressing [V] or [C] (Windows) or [Shift]+[⌘] (Mac OS X). Now that you have a true three-dimensional space to work in, complete with matching three-dimensional objects, you can create sophisticated storyboards that feature realistic interaction between 2D elements and 3D elements. By harnessing the three-dimensional nature of the car, you do not need to create extra drawings to handle the animation of doors opening and closing, or of the car rotating to drive down the street. 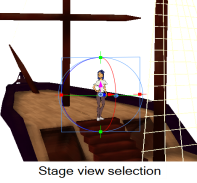 You can also use the three-dimensional nature of the objects and the scene space to allow characters to walk in front, walk behind, or even through objects without having to resize objects to create the illusion of distance. By laying these elements out in the three-dimensional space, they can physically walk around and through these objects, allowing you to create a more realistic storyboard that is closer to the final product.